Elena Bersėnas reaches for the top of a tobacco blossom as husband Juozas looks on. Background: Sigita’s parents owned a tobacco and apple farm near Mt. Brydges, Ontario, from the early 1950s until the late 1970s, when the farm was expropriated for the construction of a divided-lane highway linking Sarnia and London. LH: Could you give a brief history of your family and how they wound up in Canada? SB: My mother, Elena Morkūnaitė (1923–2018), and father, Juozas Bersėnas (1911–1986), were born in Lithuania but did not meet until they immigrated to Canada after World War II. Both fled Lithuania in 1944 to escape the raging battle at the Eastern front between the retreating German and advancing Russian armies. After the war, my parents were among 165,000 so-called ‘displaced persons’ (DPs) admitted to Canada as contract workers to bolster its burgeoning post-WWII economy. My mother worked as a nurses aide at the psychiatric hospital in Whitby, Ontario, for the duration of her contract. My father worked at a dairy farm near Belleville and a metal casting plant in Welland where his brother’s family had settled. When they had fulfilled their contractual obligations to Canada’s Ministry of Labor, my mother and father moved to Toronto, where they met. LH: How did your family get into tobacco farming? 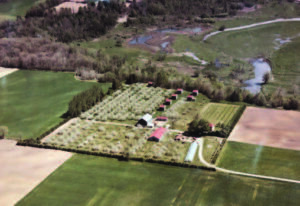 An aerial view of the Bersėnas family farm as it appeared in the mid 1970s. Now, Highway 402 runs from left to right through the center of the property. SB: Both parents grew up on farms – my mother near Joniškis and my father in the Kėdainiai region – so they were familiar with the demands and appeal of farming as a way of life. A specialist in animal husbandry and flax production with a knack for management, my father’s education and work experience in Lithuania prepared him well for running a farm. He had even grown tobacco on a farm near Kelmė where he ran the flax factory and the lumber cooperative. When he arrived in Canada in 1948, my father was 37 years old. Without English proficiency and a sought after profession or trade, he soon realized that even in a big city such as Toronto, his employment options were limited to the steady but modest wages of entry-level factory jobs. Eager to supplement his earnings at the Neilson chocolate plant where he was then employed, he and other DPs gravitated toward well-paying seasonal jobs on southwestern Ontario tobacco farms owned and operated by the preceding wave of Lithuanian immigrants who had settled the area in the 1920s and ’30s, during the nascent stages of Canada’s tobacco industry. Somewhere between Toronto and the tobacco fields of southwestern Ontario, my father (who wore old suits as work clothes and, on his tractor, reminded me of Eddie Albert in the sitcom “Green Acres”) had his own ‘farm-living-is-the-life-for-me’ moment. 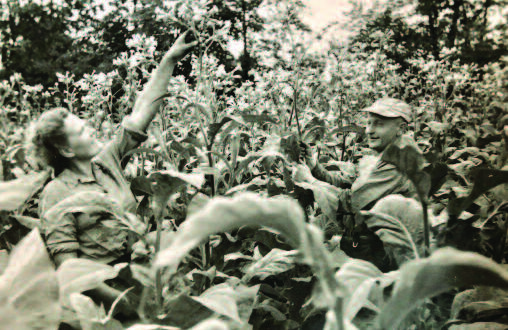 By the 1950s, established Lithuanian farmers who had been growing tobacco for a couple of decades were ready to retire. When he learned that the owners of a picturesque 125-acre tobacco and apple farm overlooking the Thames River valley southwest of London were looking for a buyer, my father persuaded a group of friends and relatives to pool their savings and to buy the property. According to the terms of their partnership agreement, my father would live on and run the farm. The investors could keep their day jobs and help out when possible. My mother agreed to move to the farm to become their šeimininkė or housekeeper. Hiring this hardworking, resourceful young woman, 12 years his junior, was the second wisest decision my father would make – asking her to marry him, being the first one. Not only was my mother a great cook and talented homemaker, she was equally skilled and willing to undertake a sizable share of the strenuous day-to-day work of running the mixed farm: from milking the cows and tending to the other animals and garden to assisting in the apple orchards and tobacco fields. When the first two bumpy years produced low yields and the investors voted to dissolve the partnership and withdraw their funds, my father was left scrambling to find a way to buy them out. During this time, my mother remained his silent and stalwart partner in the venture. No doubt her talents and commitment to this enterprise, as much as my father’s, helped earn the trust of the person who finally agreed to underwrite their loan – the Canadian lawyer who had drafted the original farm purchase agreement. LH: What is unique about tobacco farming? Are there any particular difficulties in growing tobacco leaves? Curing and preparing them for market? Could you summarize the process? SB: Tobacco is considered a cash crop, capable of high yields and earnings, provided the weather cooperates. The fast-growing plant grows up to 5 feet tall and produces 16 to 20 large, elliptic leaves. The plant thrives in well-drained, sandy loam soil and a temperate climate. In Canada, such growing conditions are found in the region known as the ‘tobacco belt’: the lands along the northern shore of Lake Erie encompassing communities such as Delhi, Tillsonburg, Aylmer, Mt. Brydges, Glencoe, and Rodney. Farmers here primarily grew ‘brightleaf,’ also known as ‘flue-cured’ tobacco, for making cigarettes. To enhance the sugars and taste, the leaves of each plant were harvested progressively as they ripened, 2 or 3 at a time, from the ‘sand leaves’ at the base of the stalk to the ‘tips’ at the top. 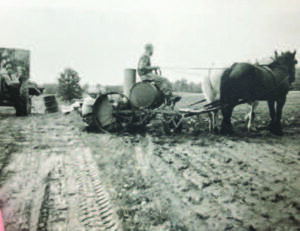 Planting tobacco with a mechanized planter pulled by a team of horses in the early 1950s. Tobacco’s vulnerability to frost necessitated starting the seeds indoors by late March in large greenhouse planting beds. In late May, when the risk of frost had passed and the fields had been plowed, tilled and fertilized, the seedlings were pulled by hand and transplanted outdoors in long, evenly spaced rows. As they grew, the plants were hoed and sprayed to control weeds, endemic diseases, and pests. If needed, the crops would be irrigated to ensure steady growth. At maturity, the plants produced a pink flower resembling the related ornamental Nicotiana alata. The blooms were ‘topped’ or snapped off by hand and any suckers (suckers are axillary leaves or shoots that can form at the axils of the main leaves when the flower is removed from the stalk and the upward growth is disrupted) similarly removed to encourage the growth and maturation of the remaining leaves. Harvesting consisted of ‘priming’ or picking the leaves in the field; transporting them from the field to the kiln area; tying (later sewing) leaf stems together onto long lath sticks; and hanging the leaf-laden sticks on tiered racks inside kilns. It took one work day, one day’s wages, and 1,200 sticks to fill a kiln. Once filled, the kilns were heated with fuel-powered burners for 3–5 days, until the leaves turned golden in color and had sufficiently dried. Cured leaves would be removed from the kilns and neatly stacked in tall piles inside a (tobacco barn so the kilns could be reused. (A silent British Pathé film from 1947 called the “Canadian Tobacco Crop” shows the harvesting process prior to mechanization: https://youtu.be/H-tMvE-u6-0). When the last leaves were picked and cured, the leaves were ‘stripped’ or sorted by grade and baled for the tobacco auction in Delhi. In the ’50s, harvest work crews consisted of 15–17 people many of whom were migrant workers from cities or other provinces and who would need to be boarded and fed. That Herculean task fell to my mother. Although some of the steps of taking the plant from seed to market were gradually mechanized and the number of workers reduced, from 1950s to the mid ’70s, when my parents grew the crop, and up to the early ’80s, when I worked in the harvest, tobacco farming was regarded as labor-intensive and even backbreaking work and, consequently, paid well. LH: On your family farm you grew both apples and tobacco. Was this unusual? Did tobacco farmers usually grow other crops? SB: By necessity, tobacco farmers had to grow other crops such as winter wheat or soy beans in their tobacco fields in order to replenish the nutrients tobacco depleted from the soil and to mitigate soil-borne diseases and pests through the practice of crop rotation. Furthermore, a marketing quota system controlled how much tobacco each farmer could grow. From what I recall, my parents only grew around 20 acres of tobacco, which was the amount that one farm with seven kilns and one tobacco crew could reasonably harvest in a growing season. As it is, we rarely took a day off during that time. Tobacco and apples, although an uncommon pairing, is not an unworkable one. In the spring, apple tree pruning preceded tobacco sowing, and at the end of the season, the tobacco harvest typically ended when the apple harvest was just getting underway. By mid October, when the apples were picked and either sold or placed into cold storage to sell through the winter, the work of sorting, grading and baling the tobacco for auction would begin. Ideally, the bulk of the work would end by Christmas, although the farm animals needed attention year round. For my parents, having apples and tobacco certainly meant considerably more work. But combining the crops also provided additional income and a cushion in case one or the other crop faltered. Besides, it was lovely to have an orchard on our farm, especially in spring when the trees would bloom and scent of blossoms would waft through the air. We also grew some heirloom varieties. Ours was not the only unusual combination of crops, however. Our closest Lithuanian neighbors, the Valaitis family, raised turkeys in addition to growing tobacco! LH: When you were a kid, what were your responsibilities on the farm? Was it hard work? What were things about it that you liked, and what were things that you found hard? 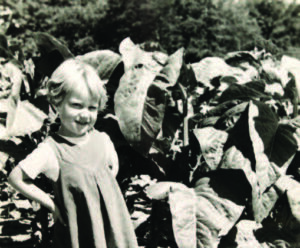 Sigita next to a tobacco plant. SB: I couldn’t imagine a more idyllic childhood than the one I had growing up on our farm. There were enough fields, forests, streams, pastures, and barns to keep a curious kid with scant supervision busy from morning to night. My parents had also succeeded in recreating a traditional Lithuanian homestead on our farm, so there was never a shortage of delicious hams, sausages, cheese, and home-baked Lithuanian bread to indulge in. But during the busiest season, the tobacco harvest, it was all hands on deck, even little ones. Whether in the kitchen or in the fields, we were expected to help out and willingly did so. We were paid for our work, but required to save our money for college. Our jobs were commensurate with our abilities, but not necessarily our ages. Consequently, we got to drive tractors and trucks far earlier than most and assumed weighty responsibilities such as supervising and setting the pace and example for workers who were older than we were. Some of the work was very hard, such as hoeing, carrying and assembling steel irrigation pipes, standing and working at the tobacco tying machine all day, and priming. [Editor’s note: see inside back cover of this issue of LH]. At times, the conditions could be unpleasant. Whether out in the field or inside the kiln, in the morning or on a rainy day, brushing past wet, cold tobacco leaves felt like a slap in the face. All that being said, even though my scarred hands and arthritic joints do not share my enthusiasm, to this day I prefer the satisfaction of rigorous manual labor to sitting in meetings or working at a computer. I fondly remember the many people – some real characters – who worked for my parents over the years, including many Lithuanians. In addition to family friends and relatives, some were first-wave immigrants, who spoke Lithuanian with endearing dialects using archaic diction that predated the standardized Lithuanian spoken after World War I. Most of the Lithuanians were DPs, like my parents. Some of the itinerant men – confirmed bachelors or men whose families were left behind in Lithuania – would spend Christmas with us. I believe one of the men – Mr. Cibulskis whose last name means ‘onion’ in Lithuanian – even turned up in Canadian author Antanas Šileika’s autobiography, Buying on Time (Ontario, 1997, Porcupine’s Quill). Mrs. Matilda Uždravis, whom we called “Babū” and who was my mother’s indispensable helper in the kitchen, was so beloved that she became our surrogate grandmother and my parents’ wise and soulful confidant well after we sold our farm. 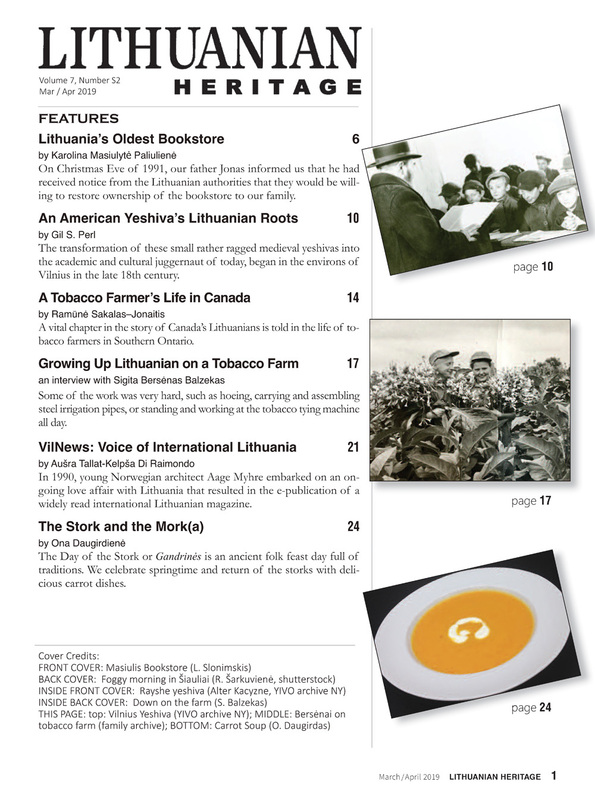 LH: What were the relationships among Lithuanian Canadians working tobacco farms? Did they get together socially? Help each other out financially? Did you play with children of other tobacco farmers in your area? SB: Lithuanian farmers helped each other immensely and formed tightly knit communities. I am not sure to what extent they helped each other financially, but know they generously supported their local Lithuanian churches and communities as well as Canada’s Lithuanian community at large. They established Lithuanian heritage schools for their children and maintained local chapters of Bendruomenė, the Canadian Lithuanian Community. Tobacco farmers, including Vincas Ignaitis and my father, helped establish Kanados Lietuvių Fondas, the Canadian Lithuanian Foundation. Our Lithuanian neighbors carpooled children to Lithuanian Saturday school classes, folk-dance practices, and other social activities. They exchanged what they grew in their gardens and what they baked or preserved in their kitchens. Although not farmers themselves, Lithuanian friends and relatives, who lived in London, Detroit or Toronto, would work on the farm during the tobacco harvest, or come and help out during summer vacation or the fall apple-picking season. There weren’t many Lithuanian farming families in our area and our farms were a few miles a part. We mainly interacted with other Lithuanian farm kids while carpooling to Lithuanian school and other activities or when our parents would visit each other’s farms. Our closest Lithuanian neighbors were the Valaitis family, and they lived 2.5 miles away. I fondly recall many parties and holidays at our respective homes and a lot of baked goods, apples, and turkey eggs exchanged between the two households. We even shared a tobacco harvest crew for a couple of seasons. Their kids were closer in age to my older siblings, and they definitely chummed around. LH: What Lithuanian communities in Canada did you interact with? How far away were they? How often did you travel to the bigger cities for Lithuanian activities? Were you involved in Canadian Lithuanian youth groups? SB: Our closest Lithuanian community was in London, Ontario, 15 miles away. We belonged to the Our Lady of Šiluva Church, which was the heart of our social world. We attended Lithuanian School in London, as well as many commemorations, conferences, and celebrations including cross-cultural events and parades showcasing the City of London’s ethnic communities. We hosted several gegužinės or picnics on our farm, including a Lithuanian Student Association campout attended by students coming from as far away as Detroit, Toronto, and Cleveland. My father was active in several organizations, including the Canadian Lithuanian Community and the Lithuanian Foundation, and made regular trips to Toronto, which was two hours away, for meetings and other events. Trips to Chicago and points more distant, such as Montréal, were reserved for weddings, World Lithuanian Day celebrations, congresses, song and dance festivals, and other special occasions. 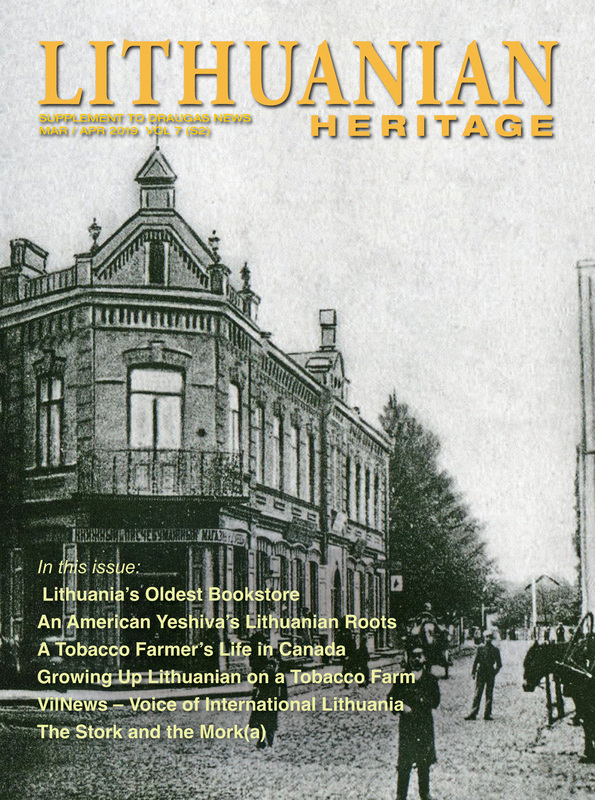 LH: To your knowledge, are the Lithuanian-run tobacco farms in Canada still in operation today? If not, what happened to them? SB: Canada has a tax-payer sponsored universal health care system. When the deleterious health effects of tobacco consumption were exposed, apparently the government of Ontario weighed the tax revenue and employment benefits of growing tobacco against the costs of treating chronic, smoking-related diseases – namely lung cancer, emphysema, and heart disease – and developed programs and incentives to reduce tobacco consumption and production in the province. Most of the Lithuanian farmers we knew had sold their farms or stopped growing tobacco well before this time. 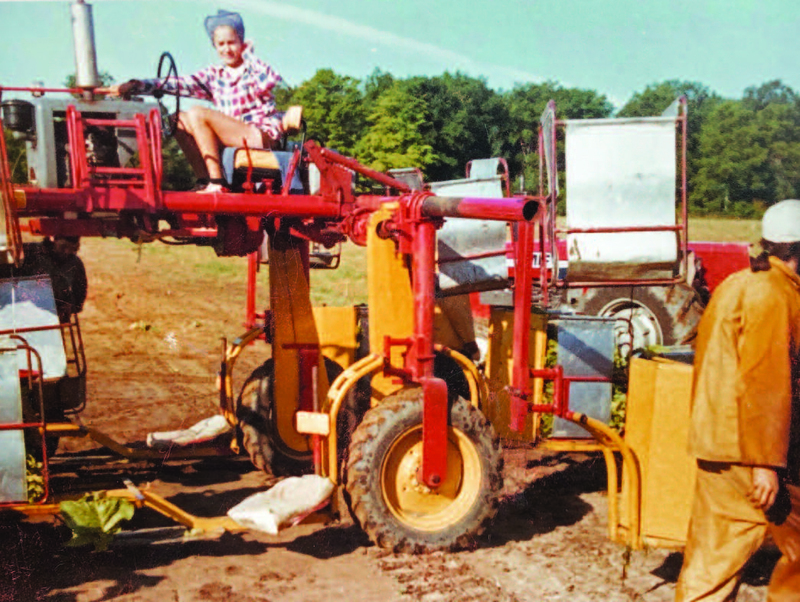 Sigita Bersėnas Balzekas as a teen, working on the family tobacco – apple farm in Ontario, Canada.